Solar Battery Operated Knapsack Sprayers is one of the finest innovations done in India. This agricultural sprayer is provided with a rechargeable battery instead of the conventional handle-lever system. With the help of attached Solar panel, farmer is able to charge the Agriculture Solar Battery Operated Knapsack Sprayer while spraying or lying idle. 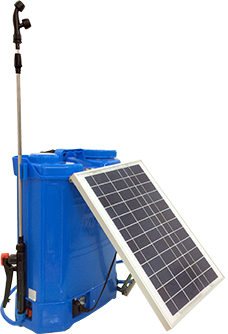 In HYNEXT Solar Battery Operated Knapsack Sprayer, the solar panel is fixed onto the Sprayer. Solar cells present on the panel are used to convert solar power directly into electrical energy by means of a PV principle. The electrical energy received from the solar cell is stored in 12 Volt battery which is fitted inside the Battery Sprayer. These Solar Battery Operated Knapsack Sprayers comes with 12V 8AH Battery and other options too. Solar Panel: Class ‘A’ Mounted on the tank. Adjustable at various angles..Pump & Battery Mounting: Mounted on Solid Strong Plastic Base. Our Solar Battery Operated Knapsack Sprayers are tested by Govt. of India approved State Agricultural Universities.